kiwisa (North Shore, New Zealand) on 26 July 2012 in Landscape & Rural. Here I go again, Rangitoto Island. I was delighted to capture the sun's reflection in the pool of shallow water at low tide. So vast, so well composed, such a pleasure of light and compo ! Une belle symétrie, des couleurs et une lumière très douces, j'aime beaucoup. A quiet landscape. It gives me a sense of stillness. 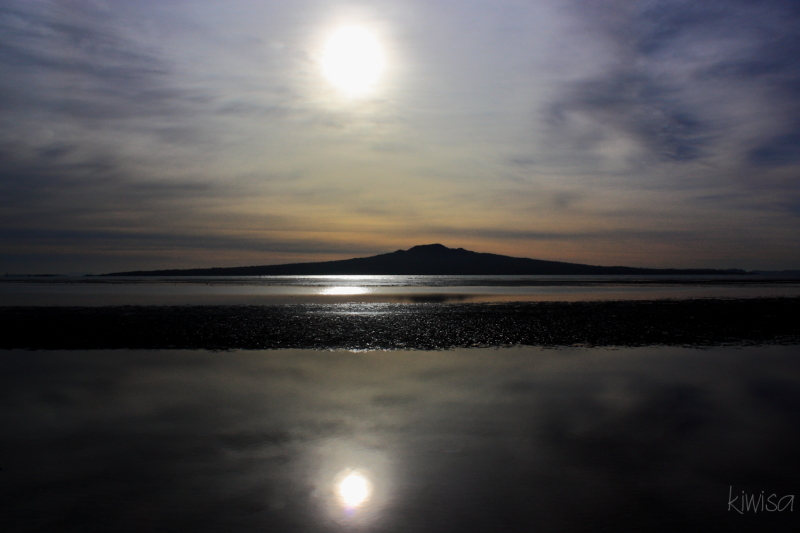 I can never get tired of Rangitoto...perfect timing with capture of the sun reflection at low tide. Enthralling image with the lovely water colour effect of the sun's reflection! quel reflet de ce soleil quelle vue et iamge sueprbe cile et ambiance. Splendid tones . An artistic photo ! SUch a beautiful image. I love the lighting and the reflection in the water. Beautiful work. The reflection takes this fine image a notch higher. Truly a first rate image. like a world upon a world. Excellent. Very well taken of sun reflection at low tide. I like the gray tone. Light and reflection are absolutely wonderful !!! The light and the reflections are stunning in this fine shot, Frances.